With our initial environment inventory complete, we need to collect performance data from the environment. 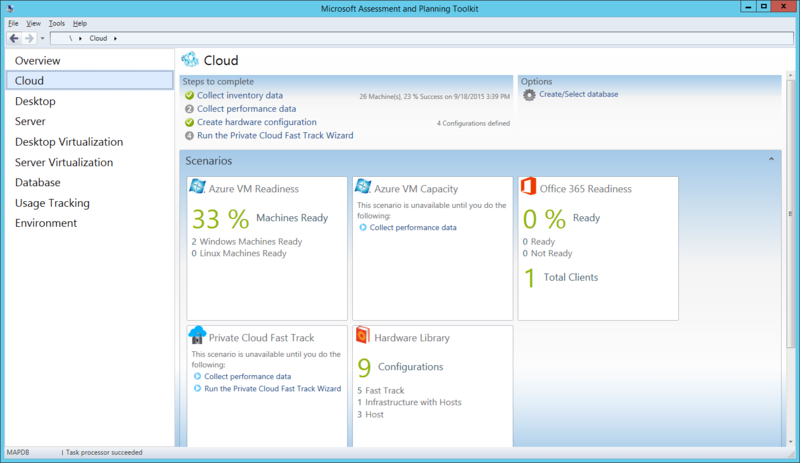 On the main screen of the Microsoft Assessment and Performance (MAP) Toolkit, navigate to Cloud in the left-hand menu. From the Cloud workspace, in the Step to Complete section click on the ‘Collect performance data’ link. This will initiate the Performance Metrics Wizard. On the Collection Configuration screen, you can select the type of systems to collect data from. 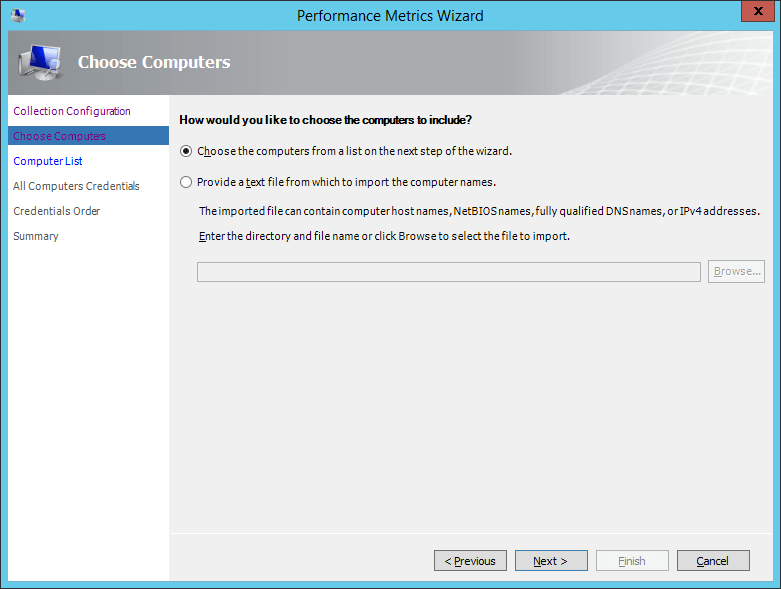 You will also need to specify the end date and time for the performance metric collection. Once this has been specified, click Next. On the Choose Computers screen, you can choose to select computers from a list, or provide a list via a text file; then click Next. On the Computers List screen, if you selected ‘Choose the computers from a list on the next step of the wizard’ on the previous screen, you will see a list of systems in your environment. It will also show the OS, Class, Workloads, etc. Make your selections then click Next. 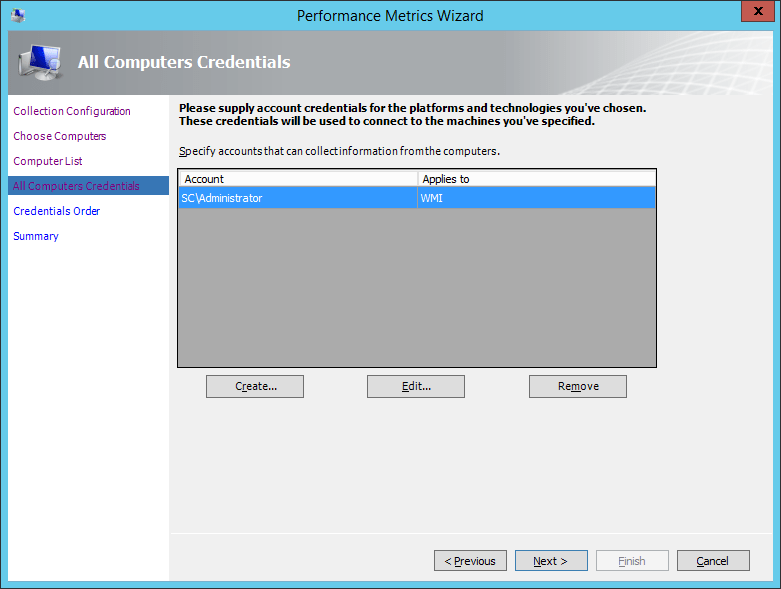 On the All Computers Credentials screen, you need to provide account credentials that will have sufficient rights to collect performance data from the systems previously selected; then click Next. On the Credentials Order screen, if you’ve supplied multiple credentials, you can specify the order that they will be tried; then click Next. On the Summary screen, review the actions that will be performed, then click Finish. Once the performance metrics collection is complete, click Close. Now that we have all of the data collected, let’s check out the assessment results; in Part 4: Azure VM Readiness/Capacity Assessment Results. ← First Experiences With the NEW Service Manager (SCSM) HTML5 Portal!